Through personal experience, observation, and the news, people are aware of human vs. river conflicts like flooding, drought, and destruction of infrastructure. Streams have been altered for flood control, navigation, and other needs, negatively affecting the physical and biological functions of flowing waters. These alterations are among the most tangible and pressing environment problems we face. To make sound river restoration a reality, more active engagement in scientific processes is essential in training future geoscientists and in fostering informed decisions on science and societal issues. Emriver models, also known as stream tables or moveable bed models, use flowing water and moveable media to simulate sediment. These models help meet science education challenges by connecting science to everyday life. They realistically and dynamically simulate a wide range of fluvial processes and enable learning tied to real-world problems and solutions. Without physical models, students observe a static, post-erosion river; look at pictures and video of the river in its current state; or study historical geological events. 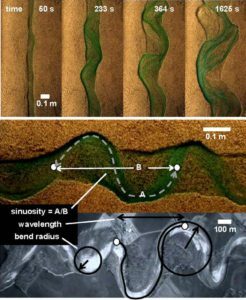 The river model transforms observation into hands-on interaction and encourages experimental activities tied to fundamental geomorphic processes. Using stream tables to study rivers also provides a powerful means of teaching STEM (Science, Technology, Engineering, Math) principles and puts the student in control of his or her learning. This kind of teaching engages students, fosters critical thinking skills, develops positive attitudes towards STEM, and prepares the next generation for a world where interaction between humans and rivers will be increasingly important. Streams have been altered for flood control, navigation, and other needs, negatively affecting the physical and biological functions of flowing waters. These alterations are among the most tangible and pressing environmental problems we face. Emriver stream tables can be used in a wide range of disciplines and applications. The images and table below provide an overview of the topics and exercises that can be used in different educational settings when talking about, for example, why and how rivers meander. Frames from a video (top photo) show evolution of a channel from straight to meandering in a small moveable bed model. A video frame (above) from this sequence is contrasted with an aerial image from the Grand River in northern Missouri. Measurements are common in fluvial geomorphology and, either as snapshots or as a time series, can be used by students to explore basic math and geometry using the models. Other moveable bed river models are limited in their usefulness. They’re small, and their narrow widths are inadequate to properly show river meandering processes. Their smaller size and box perimeter also limit the number of students who can observe. The Em2 can easily accommodate a dozen students; Em3 and Em4 can accommodate even more. Emriver models are designed and built for years of hard use with little maintenance, and they’re optimized for size and portability. All other models use lightweight plastic boxes or tubs to contain the modeling media and water; Emriver models use strong, engineered aluminum boxes. Most other models provide no support and must be used on a table; Emriver supports are durable and can safely support several hundred pounds. The Emriver’s pumping, metering, and flow control systems use the highest quality components. The models use a durable, 12 V marine pump, which allows field use. This isn’t possible with other models without using generators. Emriver models use a precise, electronic controller to control flow rates, and Little River Research & Design offers a digital-flow controller to measure flow rates. None of the other models provide flow metering. All other models use sand as a modeling media. Emriver models use plastic modeling media made from recycled materials, which is much lighter than sand. It’s safe and clean, and its bright, varied colors show sediment transport processes better. Emriver models come with a comprehensive instruction manual with exercises and demonstrations for academic and informal education, and an informational DVD that includes a guide to teaching river conservation, with dozens of clips and teaching notes. Various pages on this website feature videos of the models in use. In addition, our YouTube channel includes all of our videos, plus a playlist of River Geomorphology videos filmed using an Emriver Em2 model. Each video in the playlist includes a description, but you can also download a teaching guide.